He has also authored a series of best-selling books, including the widely acclaimed Human Universe and the recently released Universal: A Guide to the Cosmos, and is recognised as the foremost communicator for all things scientific. 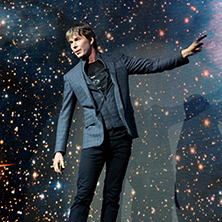 His critically acclaimed BBC series, Forces of Nature, aired in 2016 whilst he recently once again co-hosted Stargazing Live. He holds two Guinness World Record titles for a science tour for his total sell-out debut tour, which began in 2016 and saw over 150,000 attend in total, including a sell-out show at Wembley Arena.